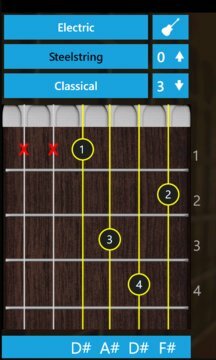 Chord Oracle is the most easy to use guitar chord generator for windows phone, and supports a lot of chord variations, ranging from simple chords like major, minor and 7th to more complex chords like 11th and 13th chords. 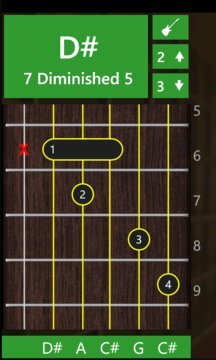 Using touch gestures you can strum or pluck the chords, or move them higher up the neck to explore all the variations. You can even change the sound of the guitar from electric to steelstring or classical!